The pin tumbler lock is a lock mechanism that incorporates pins varying in different lengths to precent the lock from being cracked. 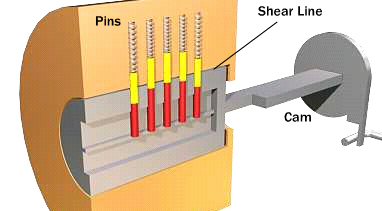 Pin tumbler locks are the most commonly used in cylinder locks, but can also be found in a tubular pin tumbler lock. The plug within the lock has a straight slot known as the keyway at one end to allow the key to enter the plug. The keyway often has ledges poking out which serve to prevent the key pins from falling into the plug, and to make the lock more resistant to getting cracked open. How to Improve your Home Security Locked out?